Denver Terpenes provide a variety of natural and synthetic terpenes. Our opinion in synthetic vs natural comparisons is that there isn't a difference in performance of the products. 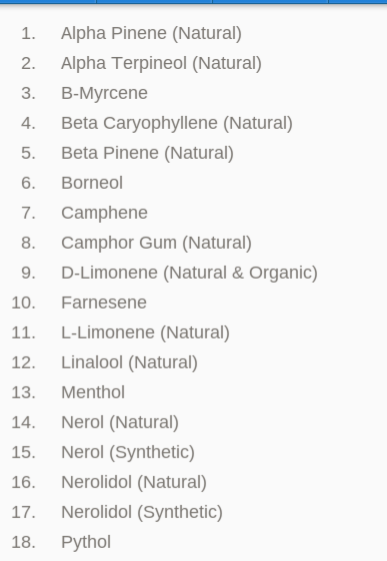 You may want to stick with natural terpenes for labeling purposes, but have no fear that just because you buy a synthetic product, you are still getting a high quality product. We can provide any volume of any of our products. Anywhere from 10 ml to a 400 pound drum. Call 303-625-7531 for more information on pricing. If you would like to purchase one of our sample kits just click here. We have everyone start with our sample packs because it will give you a great starting point for experimentation with terpenes. We have been providing our services for a good amount of time now and have yet to have a complaint. We have had orders from all over the world because terpenes really are the future for the marijuana hash industry. We also can provide you with neat blends as well. These blends are meant to take away the step of mixing your own raw terpenes. We provide a variety of lines that will change the way to dab. Get a consistently tasting product every time. Be sure to check out the rest of our website.